Stargazers have been treated to a spectacular show as the Southern Lights swept across Australia and New Zealand. Dave Reynolds photographed these images on Sunday near Cygnet, a small town south of Hobart in Tasmania. "It was such a beautiful sight - it brought me a lot of joy," Mr Reynolds, a landscape photographer, told the BBC. The Aurora Australis is caused by solar wind - a stream of charged particles escaping the Sun - interacting with Earth's magnetic field and atmosphere. Mr Reynolds was one of many onlookers watching aurora displays across southern parts of Australia and New Zealand on Sunday. He said it appeared to the naked eye as a "very bright white light" for nearly two minutes as it moved across the sky. "It was incredible," he said. "It was so bright I actually started chuckling to myself." Originally from Birmingham, Mr Reynolds moved to Tasmania three years ago. 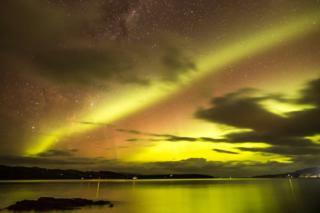 "I didn't realise you could see the Southern Lights from Tasmania until I moved here," he said. The Aurora Australis and its northern counterpart, the Aurora Borealis, are most visible near the Earth's poles.